One of the things I love most about the Indie GAL (Gift-A-Long) is the chance to discover and/or promote other designers’ work. Over the course of the GAL I’ll be publishing gift-knitting related interviews with designers whose work I admire. Steph: Have you participated as a designer before this year? And are you participating as a knitter? if yes, what are you planning on knitting? Katrine: This is my third year participating as a designer. It’s great to see knitters working with my patterns! However, for me the best part of the GAL is to discover new to me designers, and getting to knit from their patterns. It’s so relaxing to knit when someone else has done the math 🙂 You also learn from others, how they write their patterns and sometimes new techniques also. This year, I started with Fouilloy Cowl by Kathleen Sperling, and I learned how to do long tail cast-on using two colors from that pattern. Looking forward to learning much more and enjoying the knitting and chatting in the GAL group! Anything else you’re planning on knitting? Since the first time I participated in the GAL, I have been hoping to tame the opadoo. I haven’t succeeded yet, but I’m not letting it keep me from trying! I don’t have the whole opadoo planned, but I have started the mentioned cowl and Trooper sweater by ChristalLittleK. For hands I’m making Reune mitts by Jean Clement, and for shawl I have your Breakwater! Wow! I’m super impressed by anyone tackling the opadoo (knitting or crocheting an item in each category), let alone a designer, knowing how much knitting you probably already have on your plate. And thanks for picking one of my patterns, I’m honored!! Which of your patterns do you think make the best gifts? My patterns are for knitters who like to knit stylish items that they will love to wear, but I also want the making to be interesting. Usually, this means that my patterns don’t fall into the “quick gifts” category. But if you have knitworthy gift recipients, then the Kaiku wrap would be a minimalistic design to fit many tastes and has a fun construction. The Liinu shawl also has a fun construction and it lets you play with colors and lace. If Vikkel braids are a new technique for you, then my Tauride shawl will teach you how to make them and it will also give you plenty of practice for them. I’m with you, I like things to be interesting 🙂 And I really love your Arctic Blizzard Socks! Find Katrine on Ravelry as birkenwasser, and check out all her designs here! She also has a website and podcast here. Steph: Have you participated as a designer before this year? Sara: Yes, this is my 4th year! I love the camaraderie that you can find in the GAL. Everyone is always so excited and ready to share the love to support indie designers. I also love seeing all the FOs and discovering new amazing designs. Are you participating as a knitter? if yes, what are you planning on knitting? I’m going to try! I’m unfortunately quite busy this year but I hope to have some time later in the month. I’m thinking of trying my hand at some brioche in one of Leslie Anne Robinson’s beautiful designs, like Whisp. I’m really busy too! I may knit some slippers as gifts, if I have the time. If you happen to know someone who loves birds, you can’t go wrong with my birdy patterns like Charadrii and Charadriiformes, as well as Bramble Birds and Owl in the Thicket Hat. Oh, I love those! I also love the science geek names. Find Sara on Ravelry as DinosaraKnits, and check out all her designs here! Steph: Hi Susanna! Have you participated as a designer before this year? What’s your favorite favorite part of the GAL? Susanna: This is my third time participating as a designer. My favorite part is admiring all the amazing patterns my fellow designers have come up with, finding new favorite patterns and designers, and of course the fun chatter and camaraderie in the group threads. Me too! I love browsing the participating designer thread. Are you participating as a knitter as well as a designer? I am participating as knitter, too. My brother and his wife just had their first child a few weeks ago so I want to knit everything for my little nephew. Baby knits are so fast and cute. I’d love to do the Opadoo (Steph note: the Opadoo is doing one project for each category), too, but holidays are so hectic anyways I’m trying to preserve my sanity. Maybe someday! I think patterns with which you don’t have to care about sizing and fit too much make the best gift knits. My particular favorite is the Free Falling cowl – that’s also a great stashbusting, scrap yarn pattern. I’ve knit two myself and still have the makings of at least a dozen more in my scrap yarn bin! That cowl is awesome! I love the interplay of the different stitch patterns with a unified palette. Find Susanna on Ravelry as Talvi, and check out all her designs here! Her website is here. Here’s the info: The Gift-A-Long (GAL), a 6-week KAL/CAL of holiday gifts, is running from November 23rd at 8 pm (US-EST) through December 31st at midnight (US-EST). Prizes galore (patterns, books, yarn, and more) will be available. Games, contests, recipes tips, and just general chat rounds out the festivities. 349 indie designers are participating this year! To join in the gift-a-long, simply knit or crochet any of their paid patterns and post all the required info in the appropriate thread in the group here. From November 23rd at 8:00 pm US EST – November 29th, 2018 at 11:59 pm US EST the participating indie designers will be discounting between 10 – 20 of their patterns 25% for this event. Use coupon code: giftalong2018. 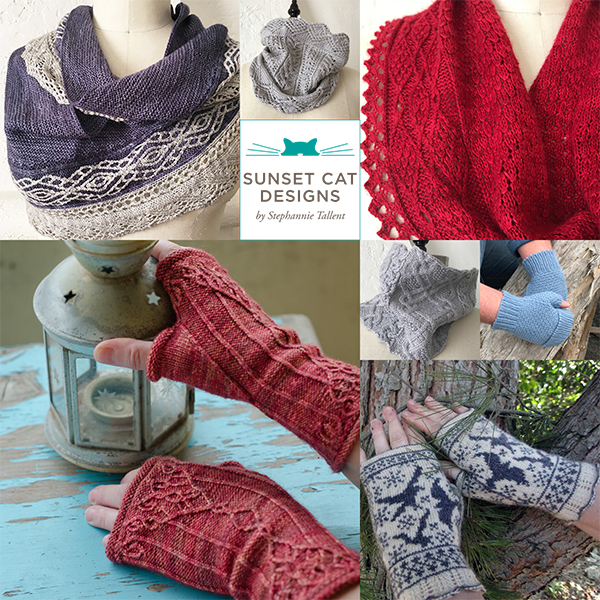 I have chosen some of my most popular popular patterns this year for the sale, ranging from quick gifts (Quercus, Manzanita and Ocotillo mittens; Artemisia Cowl; Chalk Hill Mitts; Aliso Mitts), medium effort gifts (Isn’t it Romantic?, Tafoni, Stonelace Cowl, Coronado Cowl, Wrought Mitts), to colorwork (Ravens in Snow fingerless mitts, Byzantine cowl), to two-colored cabled shawls (Sand Ripples, Alongshore), to bigger labours of love (Calliandra, Under the Sun, Flidais, Atlas Peak Stole). You can see the whole bundle here. If you’d like to know about upcoming patterns, shows, classes, and more, please sign up for my newsletter. 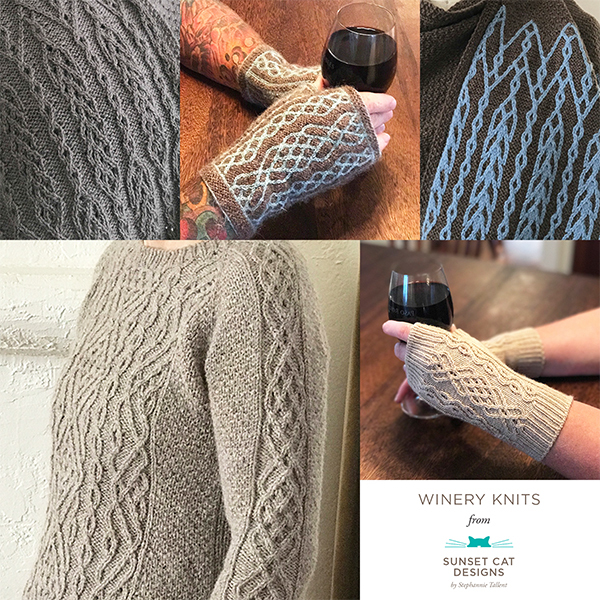 I’ll send you a download link for my Pt Reyes Mitts pattern as a thank you — a quick to knit, one skein, DK weight fingerless mitt with a high glory to work ratio! If you just want the pattern, you can easily unsubscribe from the emailing list, though I hope you stay!